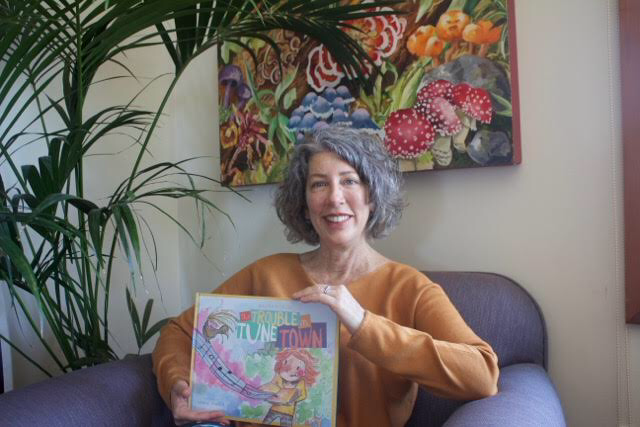 We’re excited to be talking with Maura Pierlot about her journey into writing and partner publishing, and all the aspects that make The Trouble in Tune Town so special. Thanks, Maura! In my head, I always was a writer – I can’t remember ever wanting to be anything else – but it took me nearly a lifetime to pursue it seriously and to write what I wanted to write. I’ve written in some capacity all of my working life but usually things like policy, news, ads … more utilitarian than creative. Sadly, the arts are still marginalised, I think viewed by many as a flourish rather than as an essential pursuit. I’ve always seen the arts as central to who we are, how we get along, how we overcome differences and struggles, and how we progress as a society. But they don’t pay well. So it was only recently, after I accomplished what I wanted to in other areas, that I found a way to pursue the dream that I had shelved for so many years. We all know how Meg from Tune Town needed to believe in her abilities to overcome her frustrations with the music notes. What inspired the character of Meg and her troubles with music? Meg is the prototype student who is struggling to learn a new song, wanting to give up out of sheer frustration, and suffering from some degree of performance anxiety, anticipating her mistakes. The story was inspired by our three children, now aged 16 to 19, who had piano and other music lessons for several years. But although they loved music and playing their instruments, they never wanted to practise – a challenge echoed by many other families. I think our kids found it slightly stressful to play a song for their teacher one-on-one, especially when they hadn’t practised (which was often!). I think they also needed positive reinforcement at times, and sometimes felt like the lessons highlighted what they did wrong, rather than how far they had come. To complicate matters, they were rarely excited by the canon music and classics that were always assigned; I’m sure they would have preferred something more familiar and contemporary. I can appreciate that music teachers want their students to progress, particularly when parents are paying good money for lessons, but I think the journey has to make sense, and be enjoyable, for kids; otherwise, it’s all too easy for music lessons to be just another chore in a busy week. Children have different personality types, learning styles and musical interests and abilities. Of course, it’s not realistic to expect lessons to be customised, but I think they should engage and excite young learners so they can progress musically in a fun and enjoyable way. How did you come to collaborate with illustrator Sophie Norsa? What do you like about her work and how she has interpreted your story? ​Early in the process, Little Steps gave me a list of their (freelance) illustrators and, although I was free to choose one who wasn’t on their list, I was instantly drawn to Sophie’s work. I had always imagined watercolours – something ethereal and light to complement the musical nature of the text. I liked that Sophie’s watercolours were vibrant, not washed out, but left room for the imagination. I love the little touches she added – if you look closely, some of the notes resemble a few well-known musicians. As this was a partner publisher model, I had some input into the illustrations, not wanting to encroach on artistic licence by any means, but suggesting, for example, a few double page spreads for scope and perspective and some ideas to ensure accuracy of the musical elements. Kieran came up with the idea of the lyrebird on every page as Meg’s companion, which I love. ​That’s a hard one because I’m drawn to the whole story. But I do I love the part where a frustrated Meg blames the music for her mistakes, and the disenchanted notes fly off the sheet in search of a place to belong, leaving Tune Town without any music. That concept is hard to swallow – no music in our lives … can you imagine? We take so many things for granted in life, but would be devastated if they vanished one day. I’m also partial to the jazz scene. And I love the glossary – I think it’s easy to understand and will help some budding musicians. What has your journey been like with publishing through Little Steps? What advice can you offer authors interested in going down this particular path? ​I passed on a contract with a small publisher, and this was a blessing in disguise on many levels. I had already ruled out self publishing. Having worked in media/print production in another life, I was confident that I could tackle the various elements, assembling a good team and overseeing the process, but I was bogged down with other work and family commitments and didn’t really want to fly solo on my first book. Partner publishing seemed to be a more viable alternative at the time and Little Steps, in my view, was top of the list. They have very high production standards and an easy process. I have no regrets but, with the benefit of hindsight, I can see that hybrid publishing isn’t that different to self-publishing. Hybrid publishers aren’t in the business of cultivating authors and nurturing their careers; the process is more geared to production, rather than marketing and distribution. In the end, the only person who’s going to drive sales is the author, who I think needs to be realistic about what a publisher can and cannot do. My advice for authors is to clarify their own motives – do they want to have input into all facets of production, do they not like the idea of going it alone and want someone to hold their hand, do they simply want their book published and think this is the most expeditious route? Every author is different, but I think it’s good to be honest with yourself, to work out what you’re trying to achieve and why, to be realistic in your expectations, and to do your sums. What are your top tips or ideas for educators, librarians and parents in utilising your book for valuable teaching and learning experiences with young children? ​At the risk of overstating, I think The Trouble in Tune Town opens up a whole world of possibilities. The book lends itself to musical role play, and there are any number of activities available, pitched to various age levels, that explore musical elements (melody, rhythm, dynamics). Music is a metaphor for the many things in life that challenge us, and can also be used as a springboard for discussion about children’s feelings, when faced with a challenge, to tease out the themes of self-belief, perseverance, resilience and belonging. The rhyming text presents a good opportunity for repeat reading, to explore sound patterns and also narrative intent. How does Meg feel when she can’t play her new song? Do you ever feel that way when you’re learning something new? Why do the notes go away? How does Meg get the notes to come back? There’s also good opportunity for visual literary – children can be asked to identify words in the text that relate to music, and to work out why those words appear differently in the book. The glossary of music terms at the back of the book provides a simple introduction to music theory. Teachers’ Notes are available on my websites. Your official book launch will be held on May 6th at the National Library of Australia. Why did you choose this location and what can guests expect to enjoy on the day? ​I’ve always been bookish so it’s perhaps not surprising that the NLA is my top launch location. I love the building – the design and scale, the architectural elements, the history and symbolism of a national institution. When I lived in Washington, DC, my ‘go-to’ place was the Jefferson Memorial – situated on a small island, beautifully lit at night (I often drove there when I couldn’t sleep), powerful in its silence and simplicity. In Canberra, my go-to place is the NLA. The launch will be held in the spacious entry of the library – the perfect space with vaulted ceilings, oodles of natural light, a bookshop and café nearby. A youth strings ensemble from Music for Canberra will be playing at the event, and I’ll be reading the story. There will be activities for the kids and goody bags to take home. It should be a fun day, and I’m really looking forward to it. Fun Question: If you were a musical instrument, what would you be and why? SING IT LOUD! It’s G I V E A W A Y T I M E! WIN a hardback copy of the groovalicious picture book, The Trouble in Tune Town by Maura Pierlot and Sophie Norsa! In 25 words or less, what instrument are you? 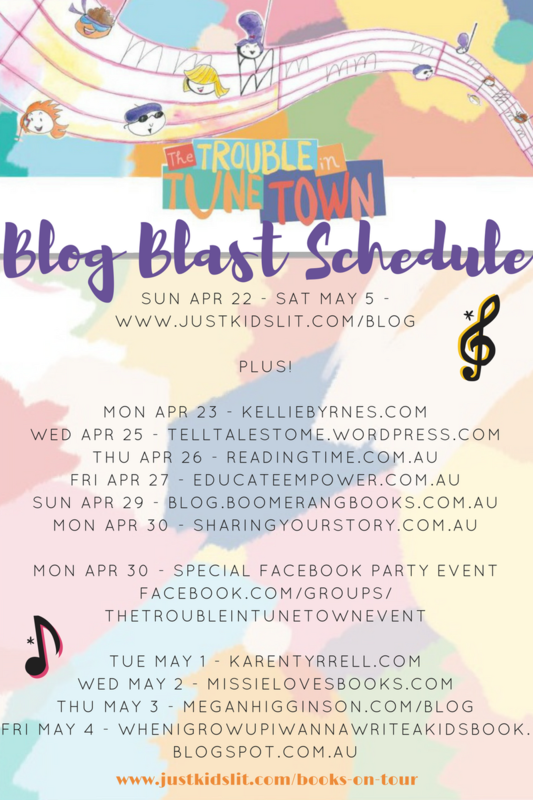 The Trouble in Tune Town will be officially launched on Sunday May 6 at the National Library of Australia, Canberra from 2PM, in association with Music for Canberra. There will music, activities, book reading and signing. Click the image for details.